By chance, the first one she pointed out was the biwa (loquat) flavored one and I knew right away that was the one we’d be getting. Growing up, my family had a biwa tree in our backyard, and while I’d eaten the fresh fruit throughout my life, I’d never tried it in ice cream form. After paying for our treat, we sat down on a bench and removed the Castella Ice from its wrapper: a scoop of biwa flavored ice cream tucked between two slices of castella. Not surprisingly, the Castella Ice was wonderful! Castella, a Japanese sponge cake brought to the country by Portuguese merchants, is one of my favorite desserts to begin with. But having it incorporated into an ice cream sandwich just made it doubly delicious. After polishing off our Castella Ice, we left the store and continued down the pathway. As it turned out, not 5 minutes later, we came upon another row of shops and it appeared that almost all of them were selling castella. I thought maybe I’d had enough sweet stuff for the time being, but then I noticed that one of the shops was the very famous Bunmeido, perhaps the most famous castella maker in all of Japan. I suggested that we go in and get a slice and a moment later we were among the throng of customers inside the store. Sitting on the counter was a tray of individually wrapped slices of castella — which I promptly bought one of. An outlet of the famous Bunmeido store. Tucking my slice of castella into my purse, we made our way down the hill. I was thinking that I would eat it when we reached our hotel, but then I noticed yet another sign that made me stop and take pause. It was a poster covered with pictures of treats but the one in the lower left hand corner was the only one I was concerned with: “Castella Soft”, it read. M sighed and said between the Castella Ice and Bunmeido castella slice and Castella Soft I’d be ruining my lunch for sure. But I was dismissive of his concerns, what was a trip to Nagasaki without indulging in one of its most famous foods? Moments later, I was clutching a Castella soft in one hand and my Bunmeido castella in the other. And yes, I was in castella heaven. And that was how it went for the rest of the time we were in Nagasaki ~ it was as if the whole world went castella on us. Everywhere we turned there was some castella-themed item staring us in the face: castella stuffed toys, billboards advertising castella, carts selling castella soft, castella donuts, pie roll castella, and even castella cider! 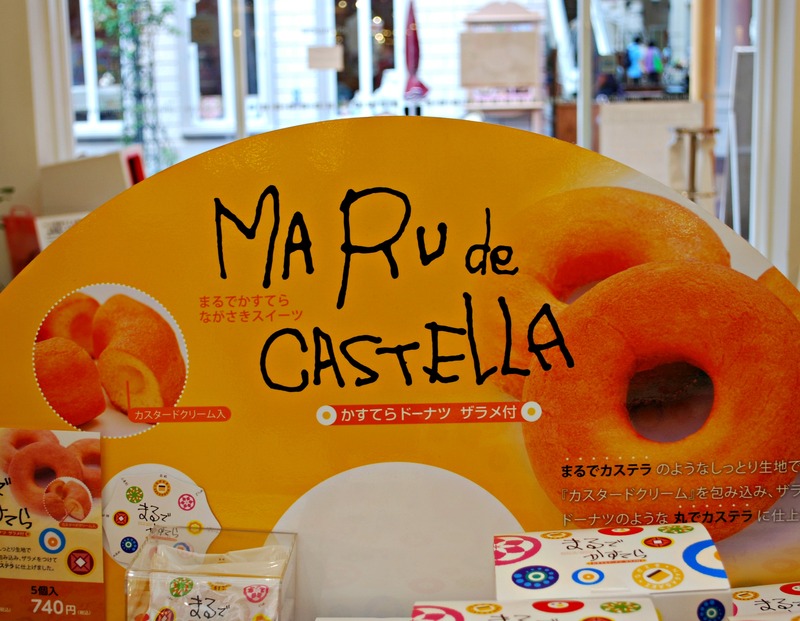 And who knew there were so many flavors of castella? Having lived in Southern California my whole life, I had only tried the original version. 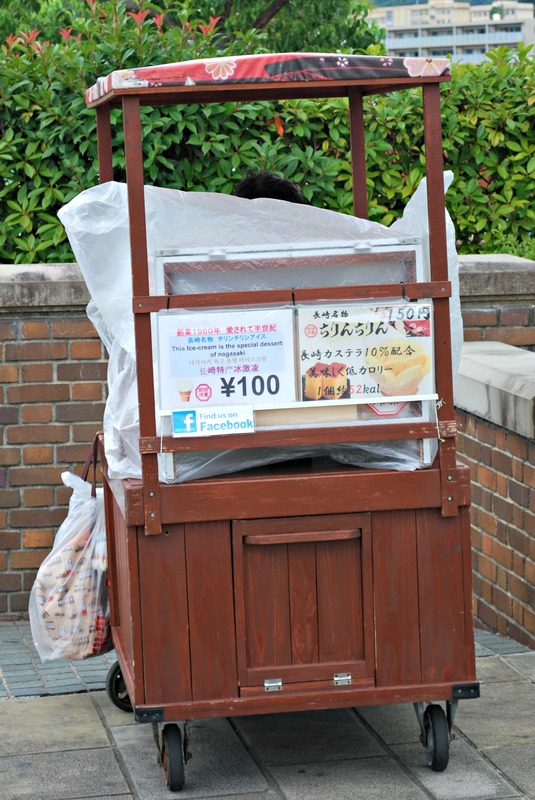 But here in Nagasaki, I saw frosted castella for the first time, as well as such flavors as chocolate, honey, green tea, black sugar, and, to my surprise, cheese. Needless to say, nearly all of my meals were “ruined” by various castella snacks but it was definitely, definitely worth it. Oh yes, we loved Nagasaki as well, definitely one of my most favorite cities in Japan. We spent quite a while at the Glover Garden, it was so interesting seeing all the houses the wealthy merchants used to live in. I was surprised at how popular biwa was in Nagasaki, I had never heard it was the thing in that city. Ah I ruined mine as well! The picture of the castella ice cream sandwich inspired me to make my own with Chips Ahoy cookies and rocky road ice cream. And I had 3 of them, terrible! My boys’ favorite! I make Castella at home. My mom makes castella from time to time too! I am going to have to find her a recipe for a chocolate one. Yeah, I got hungry typing up the post as well. Let’s just say I broke into my stash of Chips Ahoy chocolate chip cookies and rocky road ice cream and now I am scared to weigh myself lol! b) hide Chips Ahoy and Rocky Road! I’m drooling for the cakes and ice cream! Can you borrow the magic door from Doraemon and deliver me some? LOL! If I could, I definitely would! The castella in Nagasaki is the BEST, the stuff sold here in Southern California is sorely lacking in comparison. Ah yes, it was! While I’d heard that Nagasaki was well-known for their castella I didn’t know that it would come in so many forms and flavors. It’s totally spoiled me and now I can’t eat the castella sold here in So Cal. Ooh, yum. Gotta love the idea of the ice cream sandwich, for starters. The Castella Ice was wonderful! Makes we want to go out and buy some castella and make a sandwich with rocky road ice cream lol. I just wish the castella sold here in Southern California was as good as the stuff in Nagasaki. Alas I can never have this delightful treat again (unless they develop a gluten-free version)! 😦 😦 😦 Now I am distraught that I never had a chance to try the iced version or chocolate version. Bummer! I do remember you mentioning how you must stay gluten-free. What willpower you must have! My mother actually tried making a gluten-free castella a few weeks back. Unfortunately, we all thought it was terrible! Hopefully, the bakers in Nagasaki can come up with a tasty one someday. Japanese cakes look always perfect, I’m really impressed. Even though the castella is a relatively simple cake, I do love the look of it. Especially the ribbon of brown crust that goes all the way around it. I could eat just that and be happy! I like to bake and I do bake a lot, but I am really far from that perfection, unfortunately. It’s wonderful that you like to bake! I’m sure you are being modest about your baking skills but, no matter what, you are better than I am in that particular area. Baking (and cooking, in general), is really not my forte. I rely on my sister and mother to produce freshly baked goods that I greedily gobble up. Oh yes, I love cooking and baking because it’s a way to express myself. But that doesn’t stop me from devouring what my mum cooks. 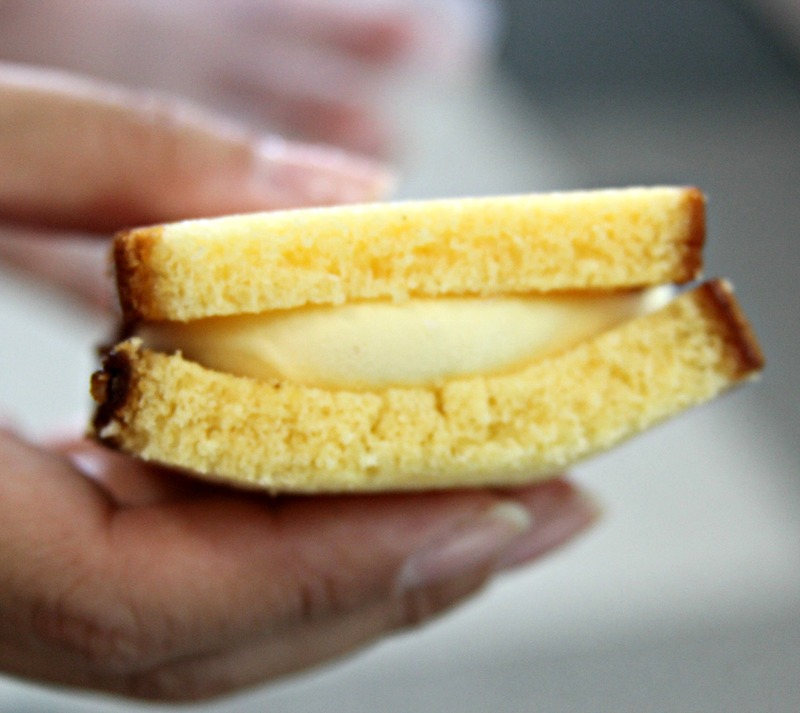 I know, I’m going to try making some castella ice cream sandwiches later in the week! The texture of the frozen castella was really, really good. Looks amazing! I can’t actually recall if I’ve ever had castella. Shame on me. 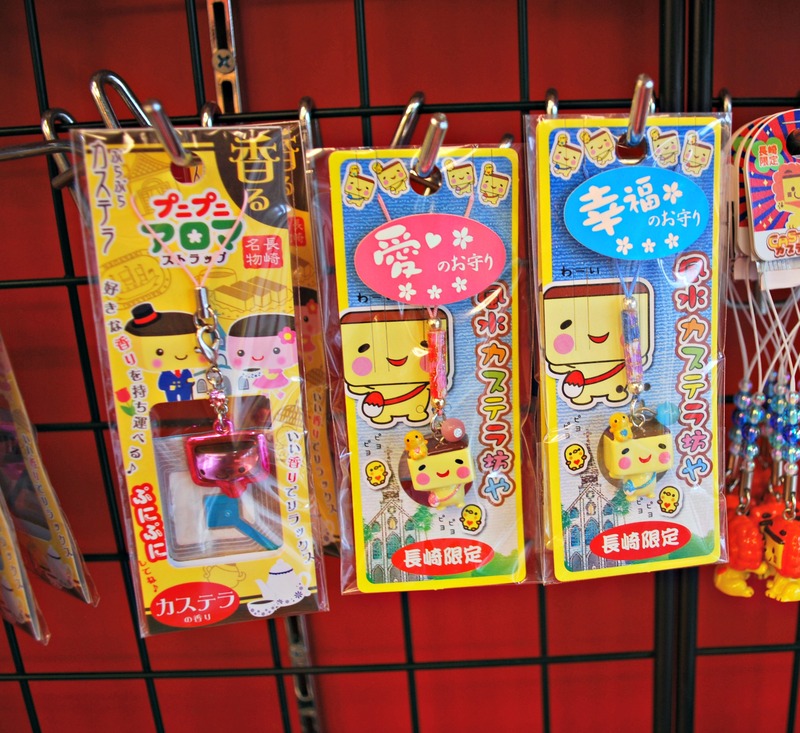 I wonder if they have any Nagasaki chains here in Nagoya? I really need to go to Kyushu. 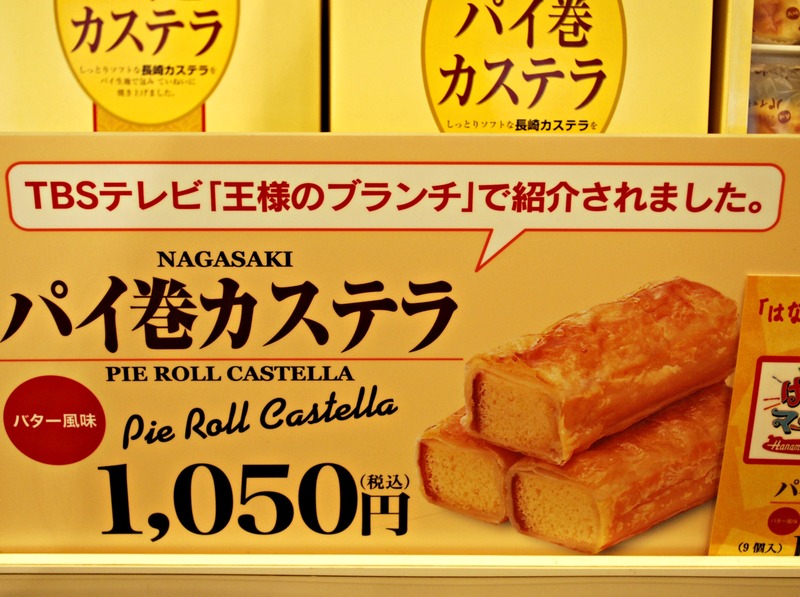 I would think Nagoya would have some of the Nagasaki castella chains since it’s a pretty major city. I thought I’d heard that Bunmeido had outlets all over Japan so hopefully there’s one there. I hope you will get to go to Kyushu someday soon, we really loved our time there. My dream is to do a road trip round Kyushu and visit all 7 prefectures. Not sure how likely it is, but we’ll see I guess! I really need to see more of Nagoya and indulge in their fabulous food. 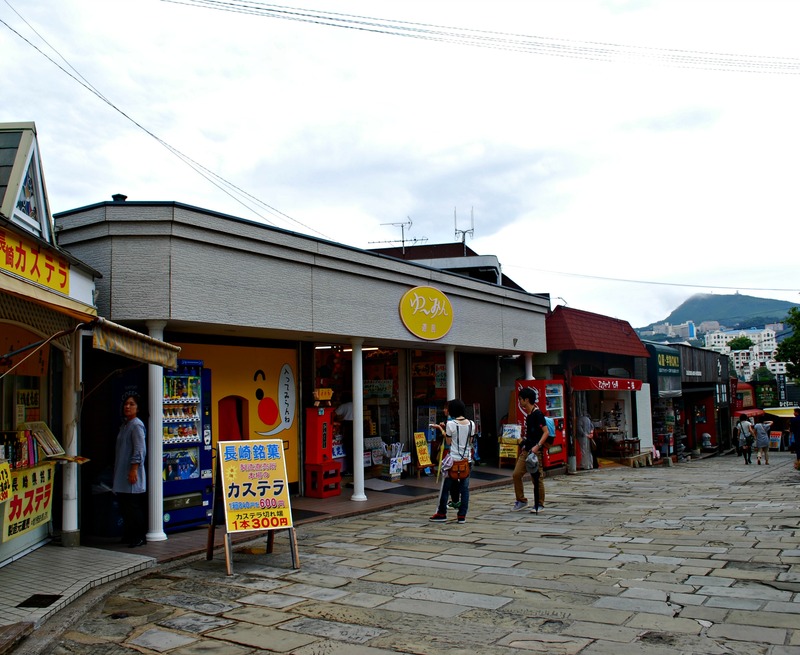 We were in the city for exactly one night back in 2012 and it was primarily to act as a hub during our day trip to Gifu. Since our hotel was in Nagoya station we never saw the city beyond the walls of the station. Such a mistake but one we really hope to correct in our future travels to Japan! We hope to do a Kyushu-based trip as well! So far on our trips to Kyushu, we’ve mainly concentrated on the Northern half. Would love to travel further down to Miyazaki and Kagoshima. As much as I want to go to Kyushu asap, a big part of me is resisting going until I have the time and money to do all of it at once. I’m doing a week in Hiroshima for Golden Week, which I’m super excited about. I’ve only been there for like one day before. When do you think you’ll be back to Japan next? Yes, I remember Nagoya Station being huge when we were walking from the train to our hotel! It would be worth going back to the city just to explore the station and all the tunnels underneath. I’ll definitely let you know if I make it back there in the next couple of years, I’m sure you have lots of tips for great places to eat in the city! 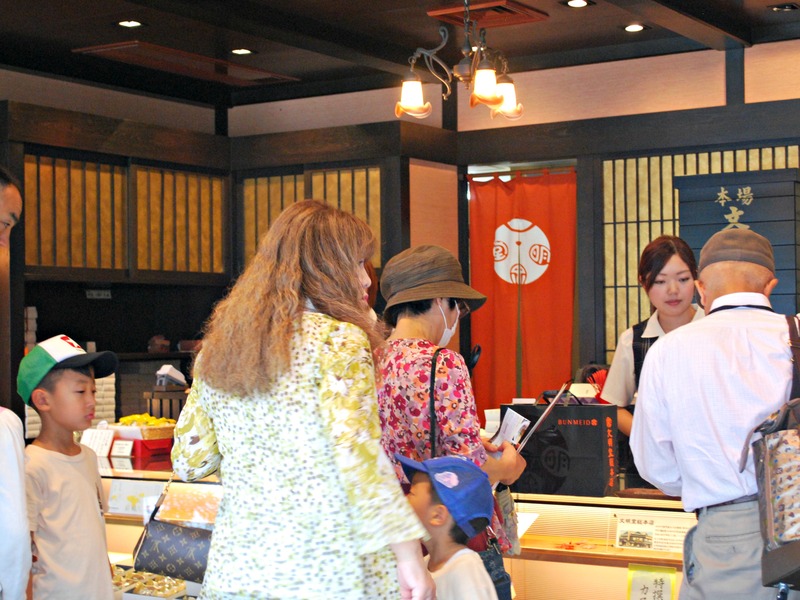 Hiroshima during Golden Week, that’s going to be so exciting! We went to the city in May of 2012 and were able to see the Peace Park and the castle and Miyajima Island. I really loved the island with all its deer and momiji manjus and anago meshi. We’re really hoping to visit Japan again in the spring or fall. My boyfriend prefers the weather in the spring but I’d rather go in the fall so Harry Potter World will be open by then lol! Our last 2 trips, we had the JR Pass so it was really whirlwind trips with us constantly on the move from one city to the next and hitting no less than 3 islands. This time I’d really like to concentrate on the Kansai region, especially Kyoto. Even though we’ve gone to Kyoto once, I got sick and didn’t get to enjoy myself. I’d also love to visit Wakayama since my mother is from the area. I’m crossing my fingers that we’ll able to make it this year! Oh, it was! And I’m glad we tried the biwa flavor since that’s not something readily available to us in Southern California. Writing this post has put me in the mood to try making my own castella ice cream sandwiches! Seriously, I could not believe how many variations of castella there was everywhere in the city. I’m sure I missed a lot of them since we were only there for 3 days. But trust me, I ate as much of it as my stomach could possibly hold lol! 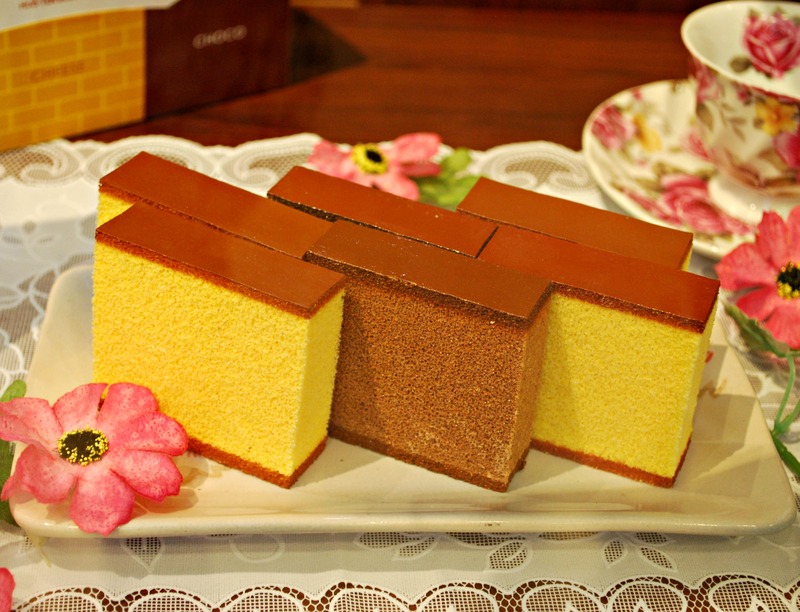 I’ve never heard of castella before, but I really want to try it now! All the major Japanese supermarkets here in So Cal (Mitsuwa, Marukai, Nijiya) are sure to carry it. I have a hankering to pick some up myself and make castella ice cream sandwiches! Yes, even though I’d heard that Nagasaki was famous for their castella I was surprised to see all the different things they’d done with it. 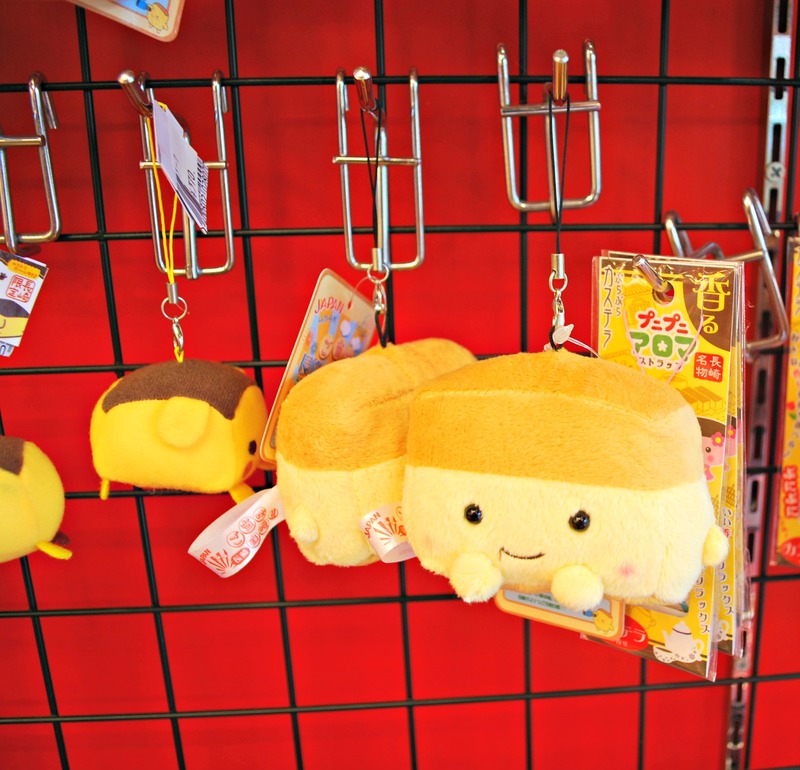 I was thinking of buying the stuffed castella for my sister but we were already getting too bogged down with souvenirs as it was! Oh my gosh! Everything is so artful in Japanese culture! I love Asian dessert cakes because they often light and not too sweet. Yum! these look too pretty to eat lol. Oh yes, one of my favorite things about Asian cakes is how they’re not too sweet. Whenever I get back from a trip to Japan and try an American pastry it’s almost mind-numbingly too sweet. 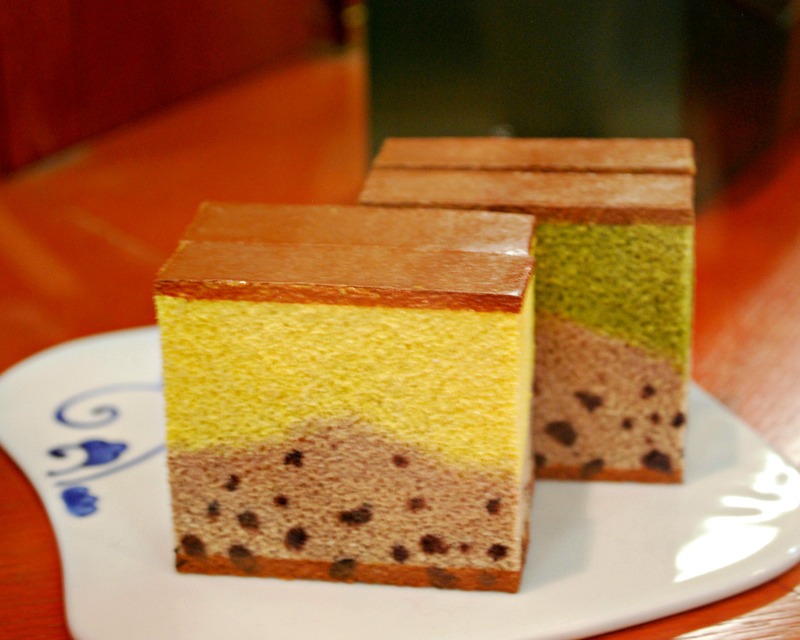 Bunmeidō’s offering looks very tasty indeed (what’s that around the edge, red bean paste? cinnamon sugar? 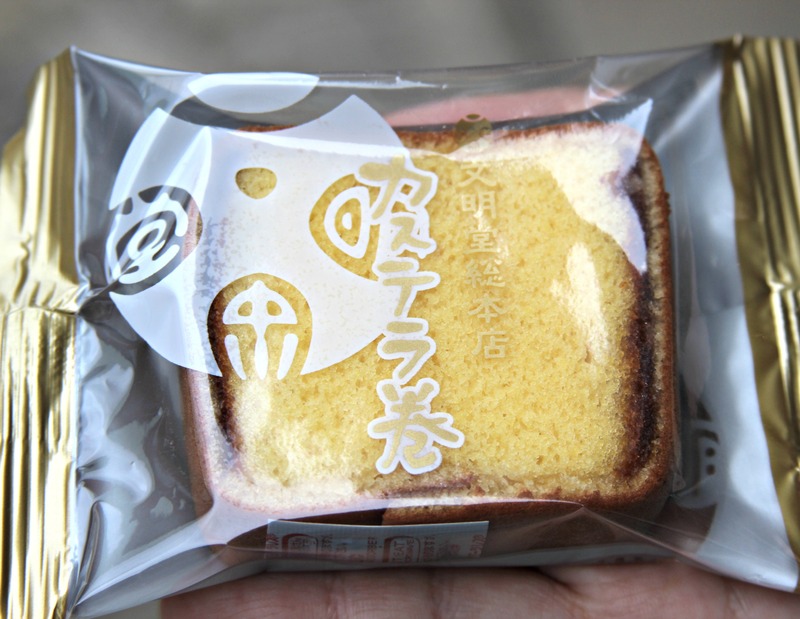 ), but truth be told, the item I’m most looking forward to sinking my teeth into is the castella ice cream sandwich. Richness upon oozing cold richness . . . my mouth begins to moisten just thinking about it. A healthy appreciation of the local cuisine is something I’m looking to develop as I get around more. Hopefully, after my wintertime sojourn in Japan, I’ll be able to return the favour of your food posts with tasty servings of my own. (That is, unless I get distracted by dusty old markers again . . ). No castella?! Tell me it ain’t so, Diego! 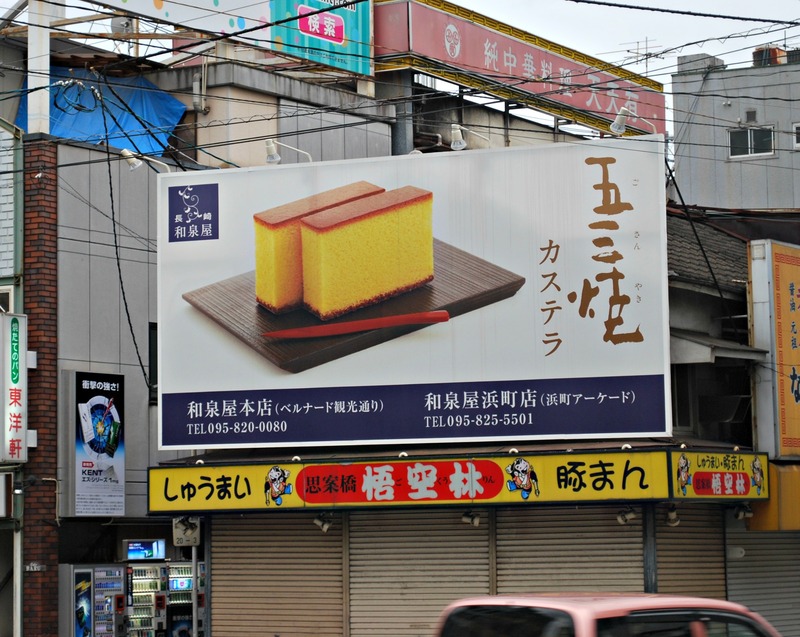 In all seriousness, a number of Japanese people I know aren’t the biggest fans of castella either. Growing up, I ate it a good number of times because my mother really likes any variation of sponge cake. But M hardly ever had it before this trip and if he hadn’t been with me, I doubt he would have eaten any castella on his own. Bunmeido’s castella was wonderful, it had a very refined taste to it. And yes, the crust was unusual in that it had a cinnamon sugar/red bean look to it. But it didn’t actually taste any different from the rest of the slice, oddly enough. 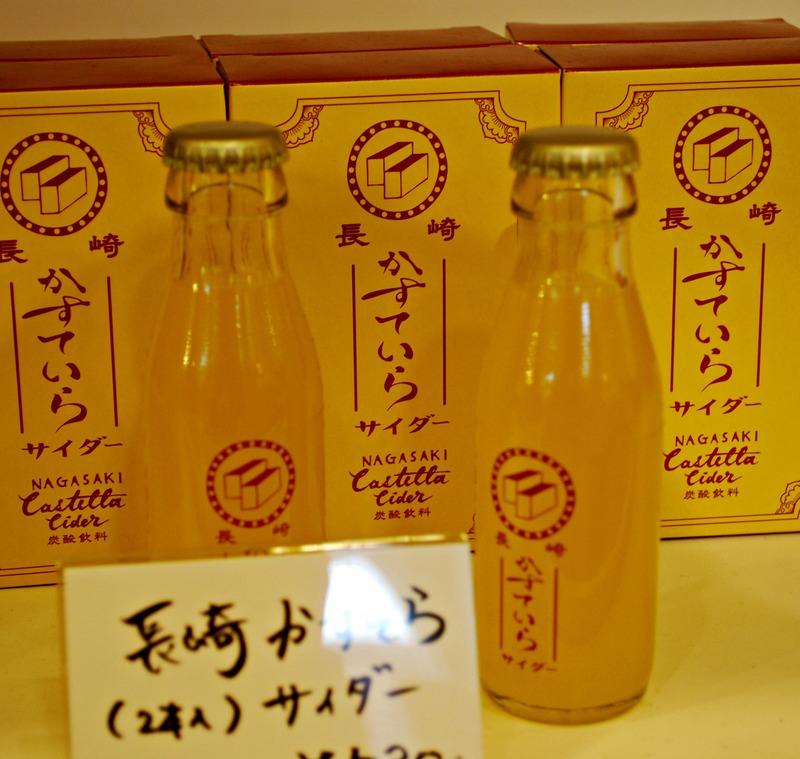 If I go back to Nagasaki, I will definitely want to try more flavors of the Castella Ice. I like to think that our Japan trips have a good mix in terms of exploring the most interesting attractions and indulging in the local food scene —- but I have to admit that a lot more research goes into the latter! 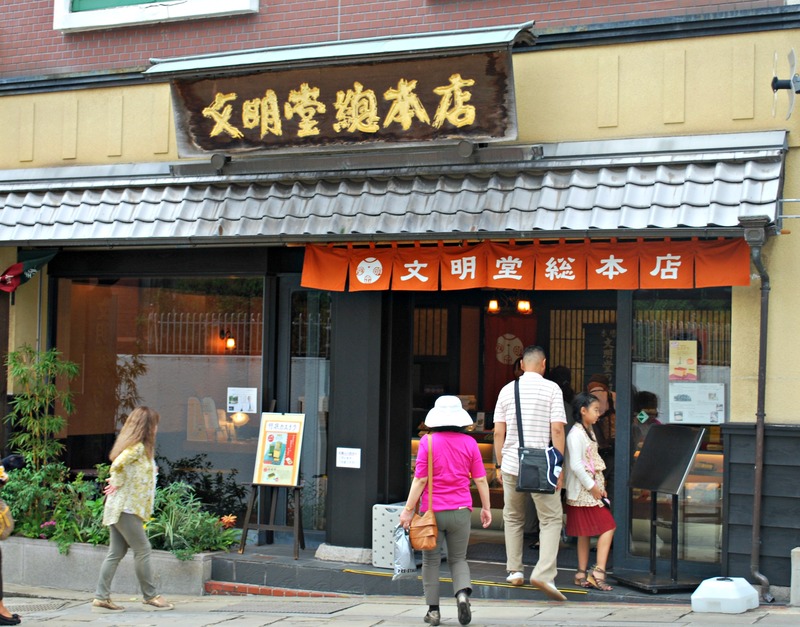 Nagasaki was especially wonderful in terms of their regional food; besides castella, we really enjoyed their champon/sara udon and Toruko Rice. The one dish we missed was shippoku but that’s alright, it just gives us another reason to return to the city someday! I am already looking forward to hearing about your upcoming trip to Japan. Sapporo has so many delicious dishes, I hope you will be able to enjoy them all. I would think the soup curry and Genghis Khan and miso corn butter ramen will be especially tasty in the winter time. I hope you have a wonderful, wonderful trip and that you stay healthy and safe during your travels. So exciting, I’m sure you will love Nagasaki! It’s definitely one of my most favorite cities in Japan, the people there are so friendly and there’s so much to see and do. Believe it or not, my favorite castella was just the ordinary one with no extra flavoring like chocolate or cheese or fruits added to it. Not to say that the others were bad or anything, I think I’m just used to the standard castella because that’s the one that I grew up eating. As much as I love castella, I have to admit that I wasn’t necessarily excited by drinking the cider version of it. Since M wasn’t on board with wanting to try it, I decided it was a no-go. That’s ok, I think we definitely got our fill of castella in other ways and that ice cream sandwich was the best of all! Castella in Southern California is nowhere near as beautiful as the ones in Japan either. Sometimes my mother will bake it, the next time she does I will take a couple of slices and make an ice cream sandwich with it! Lovely post! Made me so hungry 🙂 Castella is not usually one of my favorite Japanese sweets, but this post is really making me reconsider. I’ve never tried any of these variations, and they all look so delicious! Love those cute straps and plushies too. 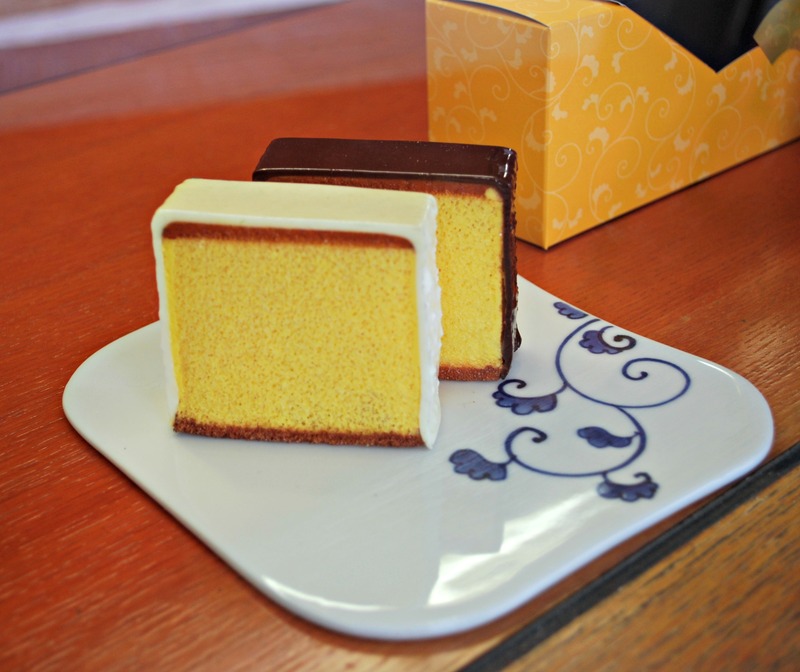 Growing up, castella was not necessarily one of my favorite Japanese sweets either. It just seemed so plain and kinda bleh. But, as I grew older and my palate changed, I really grew to love it. I especially like the texture of the crust! It was really wonderful to see all the different types in Nagasaki, I wish they would sell some of them in the Japanese supermarkets here in Southern California. Thanks for introducing Castella to me! Definitely on my must try list if I’m there! I hope you will like it if you get a chance to try it. It’s essentially just sponge cake but it has a wonderful, light airiness to it. Thank you so much! I hope you will get to try a castella someday soon. 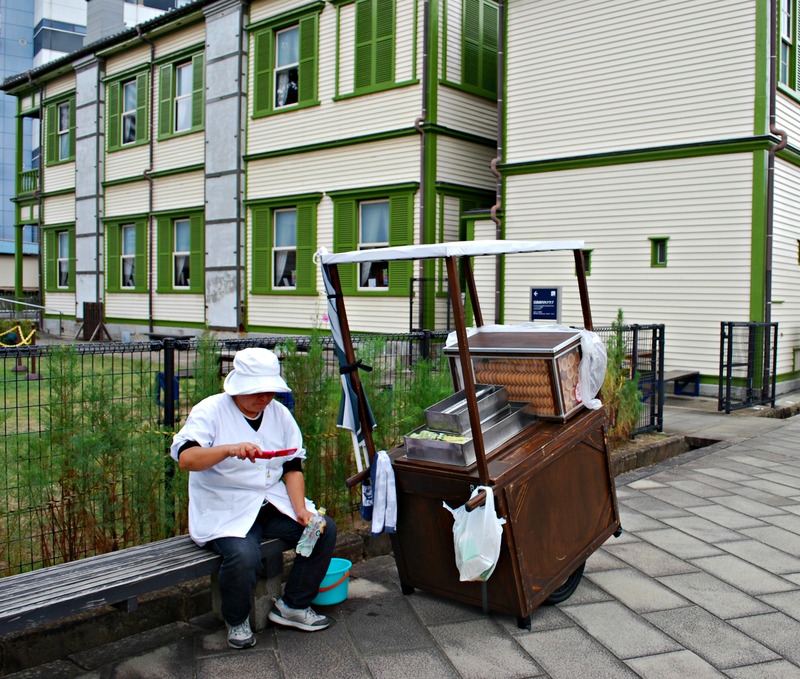 Even though I’d heard how Nagasaki is famous for their castella I couldn’t believe how omnipresent it was in the city. I actually think I ate the largest quantity of it when I was at Huis Ten Bosch. Many of the stores had samples of it and I could not stop eating them! It didn’t help that there were so few visitors in the park that day so we had no competition for the samples. I have no doubt that some of the weight gain from my Japan trip was due to castella as well! This was a fun post. It’s always neat to see how other countries interpret their sweets. The one time I went to Japan, I went to a market just to see how different the cereals, candy, and soda were from what I was familiar with. It was cool. You said you could find castella at Marukai? We come down to SoCal enough that now I have to find it! It looks so good! Even if it’s just a shadow of itself, I need to try it. Would it be in the manju section? And is castella soft really soft serve ice cream? How did it taste different from say vanilla? I love going to the markets in Japan too! I actually spend the longest time in the instant ramen aisle because I buy a bunch to take back home lol. 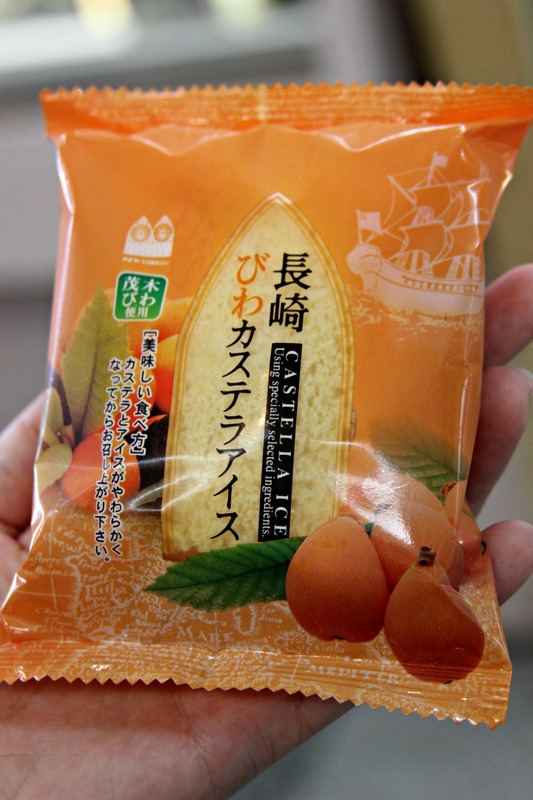 Yes, they have castella at Marukai, I just bought some the other day! I usually go to the one in Costa Mesa, it’s in a fridge with other cakes like Swiss Roll and baumkuchens. Yes, castella soft is really just soft serve ice cream. 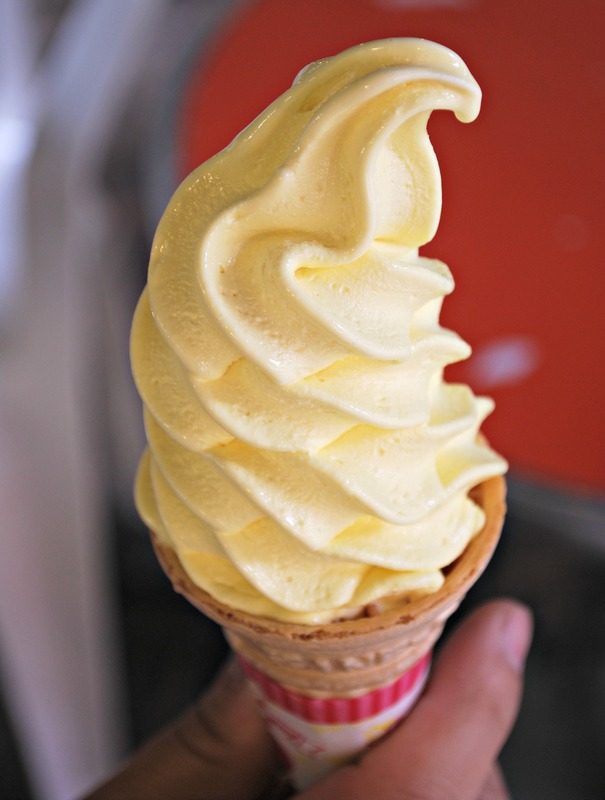 Soft serve ice creams are so popular in Japan, there are so many different kinds of flavors and it all varies depending on the region you’re in. In all honesty, I didn’t think the castella soft tasted much like castella, but it wasn’t exactly like vanilla either. I much preferred the castella ice cream sandwich, now that was GOOD! What a coincidence about your topic of castella, I seen your comment on swanlaine (as I am her friend on a website called poupee girl) and I got curious of your blog so I look and notice this castella post, and I just got a box of Nagasaki castella yesterday from my husband as a random surprise gift. 😀 I did not know much about castella actually, when my husband gave it to me yesterday he said its from Nagasaki. I did not know that its a specialty from Nagasaki and that its originally from the Portuguese, as I am not originally from Japan that is why I did not know these things before! Thanks so much for your comment! Sorry for this late response, I’m sure by now that you have finished the castella your husband sent you —- that was so nice of him! Mmm, real Nagasaki castella is so good, I especially love the texture of the crust. I live in Southern California and we have Japanese supermarkets that sell it but it’s no where near as good as the real thing. I hope you enjoyed yours! Yeah your right I finished the castella from the time you replied, it was yummy! That is cool they sell it in California, I have a friend who lives in southern California and she says she can get most Japanese snacks there at the store like you mentioned about castella. Thanks for visiting my blog! Do you visit Japan often or it was once? YUMS! the soft ice cream is a must must! 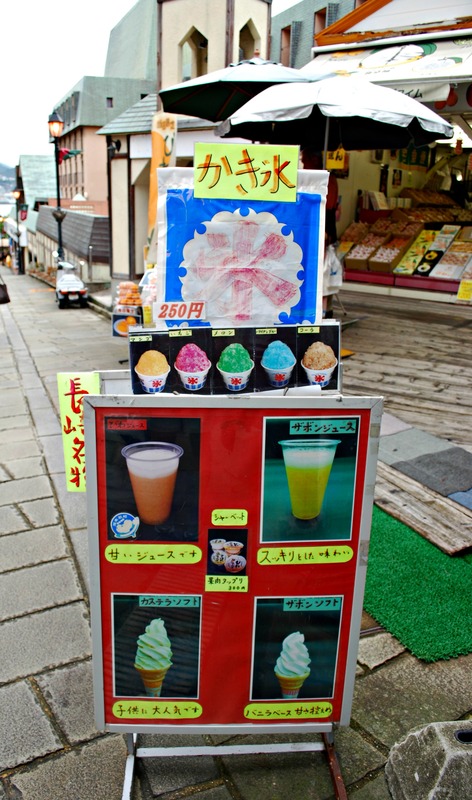 Soft ice cream in Japan tastes so good, especially up in Hokkaido where they’re known for their dairy products. The castella soft ice cream was actually a bit weird in that it really didn’t taste much like castella. But it was still good, it’s rare that I don’t like ice cream! My husband is Japanese and I just love Japanese food. When we went to Japan for the wedding ceremony I was introduced to Yokan and Kasutera! Since we don’t get either here in Sicily I have learned to make them myself. Your pictures are gorgeous! It’s like having a virtual tour. I had so much fun looking at them. Thanks so much for your kind words. The kasutera in Nagasaki was the best I’d ever had, I’d never known before that it came in so many different flavors and variations. That’s wonderful that you bake your own kasutera. But I have to admit that I am more impressed with the picture of the cannoli wallpapered on to your blog —– I just love cannolis, the cream is to die for! I try not to eat too many sweets when I’m at home, but in Japan I go crazy! The castella in Nagasaki was the best I’ve ever had, I especially loved it in the ice cream sandwich. Thank you for linking to my post, Diego! I never realized that you got a notification like this for linking. I’m glad you got to try castella and thought it was alright. I think a lot of people find it to be a bit plain their first time around. The one you got in your picture looks so big, is it a whole loaf? 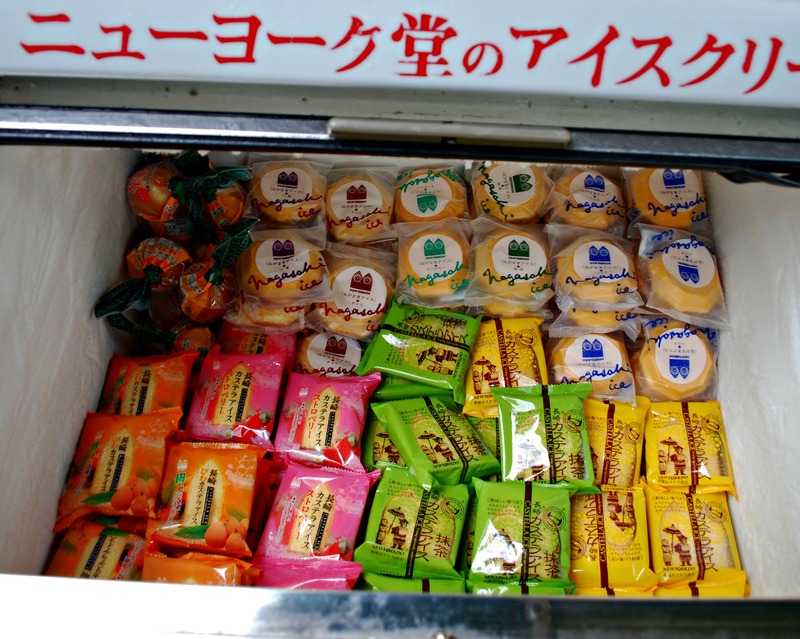 That castella ice looks wonderful! Personally, my favorites were the castella scraps sold in Nagasaki. They’re like the burnt ends of the castella world. I don’t remember seeing any of the castella scraps or perhaps I didn’t recognize it for what it was. If it consists of the crust ends of the castella then I would have loved it!